Experience the special temple experience called "Free from All Anxiety" in Myogaksa Temple with a great view of Mt. Naksan. Experience meditation, a traditional tea ceremony, and a full program of relaxation and quietness to help you find serenity. If the hustle and bustle of busy city life is getting to you, there's no better experience for you than this relaxing temple visit. 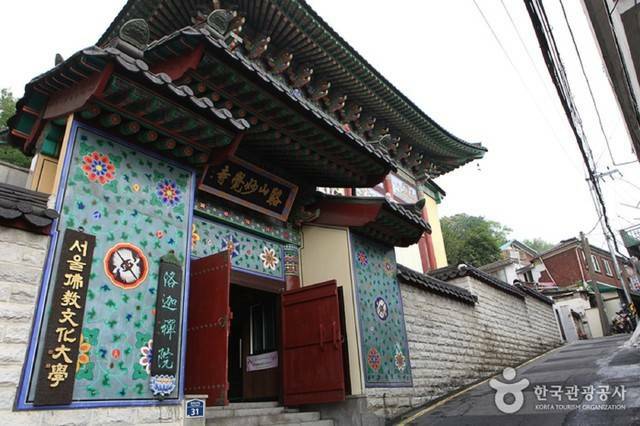 Located east of Naksan Mountain at Sungin-dong, Myogaksa Temple offers urbanites the chance to slow their pace and experience a healing temple experience. Since 2002, this visit, named the "Free From All Anxiety" Temple Stay, has seen a growing number of foreign participants per year. The program includes an orientation, 108 bows, meditation sessions, temple information, a traditional tea ceremony and a talk with a monk. You'll be able to experience traditional Korean culture, as well as learn more about Korean history through interesting stories. Leave the busy city behind for one day for a peaceful stay in a temple, and let yourself be filled with quiet serenity.